Photo by Maureen Ohar Ciancio, cropped and used with permission. Maureen says she used a zoom lens. A special visitor chose Ocracoke's ocean beach for some R & R.
An Atlantic gray seal is basking in the intermittent sun on our sandy shore. Residents and visitors have reported the sighting, and some have shared photos on social media. This has been a busy week for marine mammal sightings. 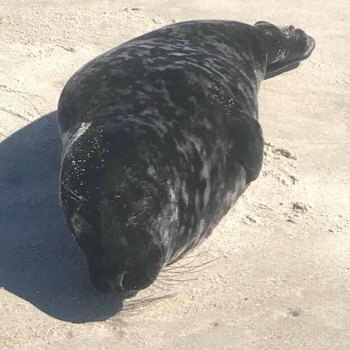 A harp seal at Corolla, a harbor seal at Carova, a gray seal at Nags Head, and another gray seal at Ocracoke have all been reported. Ocracoke's seal is adorable. He's also not wary enough of human interaction, which is putting him – and the people who approach him – at risk. "If it's watching you, you're too close," said Karen Clark of the NC Wildlife Commission. "It's important to keep your distance, particularly for this animal, which is letting people get near. It allows itself to be approached." Ocracoke's seal is the same cute critter that hauled out recently in Virginia Beach and was picked up by the Virginia Aquarium staff because of its unusual approachable behavior. They gave him some fluids, checked his vitals, tagged, and released him. A few days later, he hauled out again at Ocracoke to chill on the beach. He's so chill in fact that "someone stepped on its tail to read the tag," Karen said. He's just a pup. Karen says that's to be expected. "The young pups need more rest," she explained. 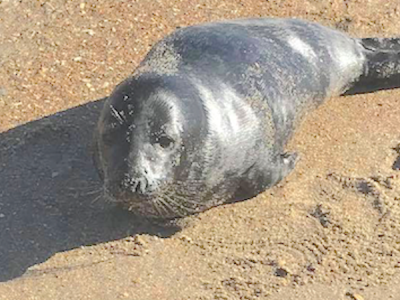 "The gray seal at Nags Head this week was a couple of months old at best; it was even still molting." Seals will rest out of the water for up to three days at a time, during which they need to be ignored. Seal sightings are fun for humans, but not so much for seals. Watching us watch them is stressful. If a resting seal pup gets scared and goes back in the water, it could, Karen said, "compromise its health." Seals are protected species and there are laws about harassing them. How do you know if you're crossing that line? When your behavior changes their behavior, that's harassment. If it barks, it's definitely upset. NOAA guidelines require 150 feet of distance between you and the marine mammals. Karen prefers not to dwell on the legalities of seal-human interactions, and appeals to our better natures instead. "I hope people feel empathy, and understand that the seals need to rest to be healthy," she said. She also noted that all the photos she's seen from recent sightings, including the photos from Ocracoke, appear to be "too close, even with a zoom lens." Take your binoculars to the beach. If you are lucky enough to spot Ocracoke's pinniped, you can spy on him from a safe and comfortable distance. The Outer Banks Marine Mammal Stranding network, a collaboration between the North Carolina Wildlife Commission, Jeanette's Pier, and Cape Hatteras National Seashore, keeps records on marine mammal sightings. They welcome your calls to the Seashore's Marine Mammal Stranding hotline at 252-216-6892.